The rise of the active format in nearfield monitoring has its roots to some extent in common sense. Even without the inherent technical benefits of active filters, in studio installations where most of the time the monitor input signal is likely to come from only one source, it’s logical to think of putting the amplification in the speakers. But even so, there still remain examples of very high-quality passive nearfield monitors on the market, and we’ve covered some of them in recent times: the Amphion range, for example. ATC SCM12 Pro.And now, here’s another example: the newly introduced, entry-level ATC SCM12 Pro. Along with their commitment to passive monitors, there’s a parallel in the way Amphion and ATC approach marketing passive in a mostly active world: they can be purchased as a package with a power amplifier. So accompanying the review pair of SCM12 Pro monitors, ATC provided an example of their entry-level P1 Pro power amplifier. Kicking off with the SCM12 Pro, my first thought was that while I’ve reviewed a couple of monitors during the last year or so that embody a manifestly hi-tech approach to monitor engineering (the Kii Three and Genelec SAM monitors, in particular), the ATC is perhaps inspired by a subtly different philosophy. That’s not to suggest that there is any lack of expertise or engineering skill within the ATC SCM12 Pro, or that it incorporates no technology, because there is huge expertise at ATC and the monitor drips engineering from every pore. However, I think smaller companies like ATC, which don’t quite have the significant financial or personnel resources of large-scale, more ‘corporate’ manufacturers, perhaps have to be smarter and more targeted in their approach to finding technological solutions to the challenges that monitor design throws up. And that, to me, feels a bit more like art than science. The term ‘artisan’, unfortunately these days devalued by countless coffee shops, breweries and bakeries, would be perfect to describe the ATC kind of company. To illustrate the kind of thing I’m getting at, put yourself in the position of the R&D director at a major, well-financed monitor company blessed with an in-house DSP department in which you know a couple of engineers have a bit of time on their hands. On your desk, and needing a decision, is an existing bass/mid driver that almost, but not quite, suits a new DSP-equipped active monitor. So, do you redesign the driver so that it works properly in the new monitor or do you brief the DSP engineers to write some equalisation code that can be embedded in the monitor’s electronics? There’s a good chance you will do the latter — not because it’s the cheaper or easier option (although it may well be both), but because it better suits your organisation and its resources. Now put yourself in charge of R&D at a small ‘artisan’ monitor company and imagine the same conundrum. You don’t really have any spare in-house DSP resources so to go down that road you would have to out-source the skills, and that’s both expensive and fraught with difficulties. But you know also that in redesigning the driver you’ll learn a little bit more about driver performance generally and that will add to your in-house bank of knowledge. And for smaller, less well-resourced manufacturing companies in any sector, accumulated specialist knowledge is everything. So there’s no contest, you’ll redesign the driver. Swerving back to the SCM12 Pro, the common thread that’s woven through it (and every ATC monitor) is the company’s unique approach and absolute commitment to driver engineering: it’s where the company’s accumulated knowledge and centre of gravity lies. It dates back to 1974 when ATC’s émigré Australian founder, Billy Woodman (a fine jazz pianist as well as a brilliant speaker engineer), left his engineering job at Goodmans Loudspeakers in Havant, UK (now, sadly, the site of a huge supermarket) to found his own speaker company. From the off, Woodman concentrated on developing and refining the driver design ideas he had been working on at Goodmans and he, and the engineers he’s employed, have continued that process of development and refinement ever since. It’s not too wild an exaggeration, I think, to write that for Woodman and his colleagues at ATC, the driver is king. The other components that hang off the drivers to create a speaker system — the cabinet, filter networks and, on active systems, the amplifiers — while obviously important, are subordinate to the noisy bits that do the fundamental job of turning electrical information as accurately as possible into acoustic information. And speaking of those noisy bits, in the SCM12 Pro they are unmistakably ATC. Beginning with the bass/mid driver, at first sight the 180mm-diameter unit perhaps looks to be nothing out of the ordinary, however behind the coated-paper diaphragm are a chassis, magnet assembly and voice-coil that dwarf the components typically found on similar-sized nearfield monitor bass/mid drivers. The scale of the engineering in the ATC driver is at a different level. I just wrote that behind the SCM12 Pro bass/mid driver diaphragm is the chassis and magnet assembly, but actually behind the diaphragm there is, effectively, a second one. The bass/mid driver employs ATC’s Constrained Layer Damping (CLD) diaphragm construction technique that comprises two thin but stiff outer layers sandwiching an inner layer of damping compound. The potential for high-Q resonances in the stiff outer layers is constrained by the inner damping. ATC say that CLD construction results in a driver diaphragm that offers a significantly improved trade-off between rigidity, weight and resonant behaviour, to the significant benefit of cone break-up control, dispersion, distortion and resonant energy storage. A CLD diaphragm is not the only uncommon feature of the SCM12 Pro bass/mid driver; buried down in the magnet assembly are an undercut pole piece and an edge-wound voice-coil. Neither feature is of course unique to ATC, but both tend not to be found in drivers used in the market sector that the SCM12 Pro inhabits. Diagram 1: Undercut pole piece and edge-wound wire (left); conventional pole piece and round wire (right). Rather than attempt a convoluted and most likely ineffective description of an undercut pole piece and edge-wound voice coil, I’ve illustrated both features in Diagram 1. 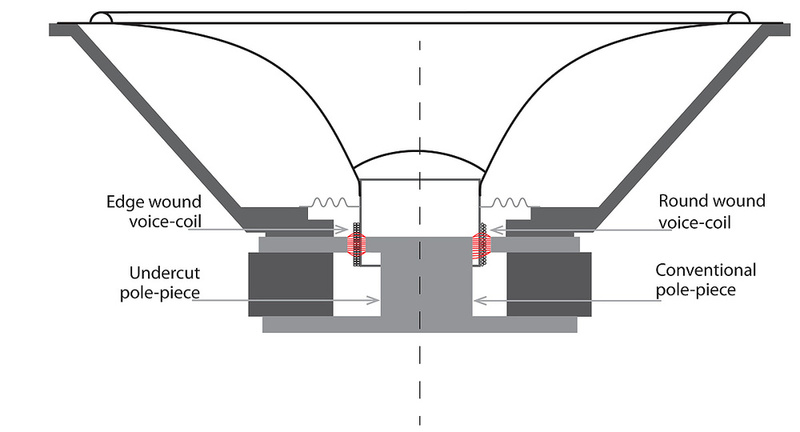 The right-hand side of the diagram illustrates a conventional voice coil and pole piece, while the left-hand side shows an undercut and edge winding. The aim with an undercut pole piece is to reduce asymmetry in the magnetic field through which the voice coil moves. As I hope is clear from the diagram, the action of removing material from the pole piece below the region of the ‘gap’ encourages the magnetic field lines across the gap to become more symmetrical. All other things being equal, the result will be a worthwhile reduction in distortion. And the edge-wound voice coil? 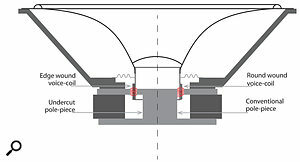 The basic principle is to get the voice-coil windings more closely packed through the use of rectangular rather than round cross-section wire. More closely packed windings means more ‘copper in the gap’ and consequently a more efficient driver with higher thermal power handling. As the diagram illustrates, the potential gains from an edge-would voice coil are relatively marginal, especially considering the technical difficulty of winding a coil with rectangular wire, but that reveals an important point about the design and engineering of drivers: it’s about doing all the small things that each provide a marginal gain. Marginal gains add up. Diagram 2: ATC’s dual-suspension tweeter design.Four paragraphs about the SCM12 Pro bass/mid driver is probably enough, so onwards and upwards, literally, to the tweeter. In-house designed and manufactured tweeters are a relatively recent development at ATC, the first one being introduced in 2013. In previous years ATC relied on a selection of tweeters from OEM companies such as Vifa or Scanspeak, but as I write, the in-house tweeter, in one form or another, has been introduced to the majority of models in the pro monitoring range. While the ATC tweeter may look like a relatively conventional 25mm soft-dome unit, it incorporates one feature in particular that is unusual: dual suspension. 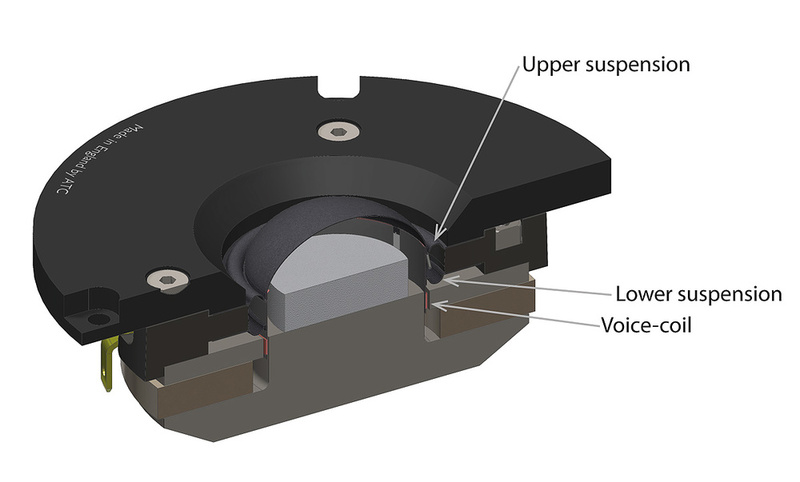 In a conventional tweeter, the dome diaphragm is suspended only from its outer flange. This arrangement is relatively simple to engineer and helps in the reduction of moving mass that’s so important if the tweeter frequency response is to extend to 20kHz or beyond. A single suspension, however, leaves the diaphragm prone to a rocking motion resulting in increased distortion, especially as volume level begins to rise. Diagram 2 illustrates a cut-away of the ATC tweeter and clearly shows the dual suspension elements: one created by the flange of the diaphragm and a lower one located just above the voice coil. A conventional tweeter would only incorporate the upper suspension element. Perhaps in an unconscious reflection of the ‘drivers first’ philosophy at ATC, I’ve so far completely omitted to describe any other aspects of the SCM12 Pro, so it’s probably about time to put that right. There is, however, not a great deal to say because beyond its driver technology the SCM12 Pro breaks little new ground. In terms of size and weight it sits right in the middle of the easy-to-install range of dimensions for nearfield monitors. It’s a closed-box system with its -6dB low-frequency cutoff specified at 56Hz. A quick close-microphone FuzzMeasure response curve, illustrated in Diagram 3, confirms the specified low-frequency bandwidth while also illustrating nicely the gentle 12dB/octave roll-off that’s inherent to closed-box systems. 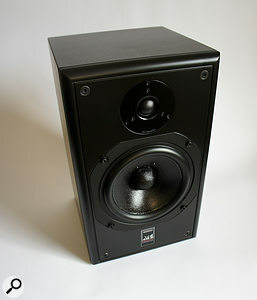 Being a passive design, the SCM12 Pro’s rear panel is empty but for connection binding posts, and being aimed very much at the pro monitoring market with electroacoustic performance the overwhelming priority, little manufacturing budget was apparently spent on cabinet finish — black textured paint being the only option. Perhaps the one concession to a more stylish aesthetic is that the soft-edged front-panel finish is semi-matte rather than textured black. And speaking of the front panel, it is slightly unusual in being a separate panel bolted to the enclosure carcass. ATC say that the arrangement results in a fundamentally more rigid cabinet because the front-panel thickness is effectively doubled. I wonder also if the interface between the front panel and cabinet carcass results in a degree of panel resonance damping too. The P1 Pro dual-mono amplifier.Before moving on to the experience of listening to the SCM12 Pro, there’s a power amplifier to describe. The P1 Pro is ATC’s entry-level power amplifier and is specified at 150 Watts per channel into 8Ω. It is conventional in terms of amplification and power-supply technology, so conventional also in terms of size and weight: big and heavy. The amplifier is configured as a dual-mono unit with completely separate power supply and amplification modules for each channel. It employs ATC’s proprietary MOSFET ‘grounded source’ circuit topology and is a notably wide-bandwidth design (-3dB at 2Hz and 400kHz) with extremely low levels of distortion (0.002 percent at 1kHz, 1dB below full power). The P1 Pro in use could not really be any more straightforward. Connect signals to the balanced inputs, connect speakers to the 4mm/binding post output sockets, switch it on and that’s all there is to do. So, with the amplifier switched on, I began listening — not to the SCM12 Pro, however, but to my usual go-to passive KEF LS50 hi-fi speakers either side of my workstation. It was important I think to listen to the P1 Pro amp with a familiar speaker before switching to the SCM12 Pro. The P1 Pro passed the test very quickly. It is clearly an extremely high-performance power amplifier — perhaps slightly warmer in presentation than the Naim amp I’m used to, but certainly right up there in terms of bandwidth, detail, clarity, imaging and that sense one gets with a genuinely powerful amplifier that volume level is effectively unlimited. The P1 Pro was also cool running and suitably silent both in terms of mechanical transformer hum or electrical noise. Little more can really be asked or expected of a power amplifier for monitoring duties. And the SCM12 Pro? Finding a path through all the conflicting constraints when designing a monitor is akin to making the pieces of a jigsaw fit together, and when you get it right, everything snaps into focus. The SCM12 Pro had that from the very start. It seems to me that monitors designed and engineered by people who live and breath electroacoustics have a signature. It’s a signature of sound quality that hangs together from the moment you begin listening. There’s no raising of eyebrows, or over-concentrated listening while you work out what’s suddenly happened to the monitoring character you were previously familiar with. Diagram 3: The SCM12 Pro’s low-frequency response (20-300 Hz). Note the shallow (12dB/octave) LF roll-off.The foundation of the SCM12 Pro is its low-frequency performance: typically closed-box with its lack of overhang and reassuring security of pitch, whatever the volume level, but with the added quality that comes from driver engineering that’s a level or two above run-of-the-mill and can play surprisingly loud. The SCM12 Pro leaves no room for uncertainty in its reproduction of kick drums and bass guitar. Furthermore, the relatively limited low-frequency cutoff (-3dB around 70Hz) is made less significant by the slow roll-off thereafter, meaning that at 35Hz the SCM12 Pro is only 12dB down (Diagram 3). There’s absolutely no sense that low-frequency bandwidth is significantly restricted by the lack of a reflex port. But it’s not just at the bass end where the SCM12 Pro excels. It has a natural, uncoloured, ‘hear-through’ mid-range quality and unforced detail in the way it presents high-frequency information, which means audio is reproduced with the minimum of speaker artifacts imprinted upon it. Stereo imaging was well focussed with good depth, and there were no embellishments or attention-drawing emphases anywhere, just accuracy and consistency. It’s exactly what’s needed from a mix tool. Diagram 4: The mid and HF response (200Hz-20kHz).If there were anything to change on the SCM12 pro, for personal preference and to suite my room a little better, I would have voiced it with a little more upper-mid energy. Diagram 4 illustrates an SCM12 Pro axial frequency response curve and although one response curve can never tell the full story, the band between 2 and 6 kHz appears a couple of dB shy. It leaves the SCM12 Pro sounding a little warm to my ears — more BBC LS3/5A than Yamaha NS10. Even so, a warm tonal balance is a benign characteristic that can be learned, or tweaked even with a little monitor bus EQ, as I did. Far more destructive in terms of using a monitor as a mix tool are time-domain, distortion, coloration or compression issues, of which the SCM12 Pro seems entirely free. Considered as a passive monitor alone, the obvious competition for the SCM12 Pro comes from Amphion One15. Considered in a package with the P1 Pro, the price puts the ATC system up against the Amphion One18 and Amp500, or perhaps conventional active systems such as the Focal Trio 6BE, the Barefoot Footprint 01 and the PSI A17-M.
Classy electroacoustic engineering for the price. Hugely capable across the whole bandwidth. Needs a quality power amplifier. Everybody’s favourite ‘artisan’ speaker company delivers the goods again. ATC’s entry-level passive monitor is a wonderful example of the art of electroacoustics. You can’t ask much more of a compact passive nearfield monitor. SCM12 Pro £1375.20 per pair, P1 Pro amplifier £2598, SCM12 Pro and P1 bundle £3456. Prices include VAT. SCM12 Pro $1990 per pair, P1 Pro amplifier $3490, SCM12 Pro and P1 bundle $4350.